I’ve written many times that fall is my favorite season. While I love everything about this time of year, it can be all too easy to over-spend on activities, entertainment and meals. However, celebrating fall while sticking to a reasonable budget is totally possible. From partaking in budget-friendly activities to using Hopster Mobile Rebates to earn cash back on everyday purchases, keep reading for some financially-savvy ways to make the most of this season. Simply choose the rebates from the large selection of products & brands. Some rebates for national brand name products, while other rebates are for generic products (like any brand of milk). Shop at your favorite retailer. 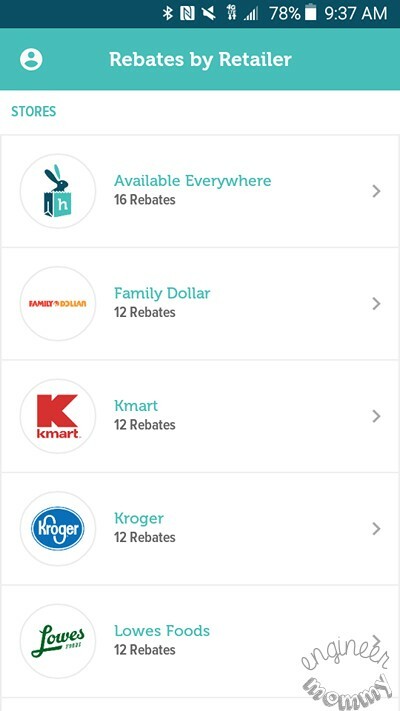 Rebates are grouped by retailer on the home page of the app. Snap a photo of your receipt that shows the items purchased. Rebates will be redeemed as soon as the purchases are confirmed. What I really love about this app (and what makes it unique) is that there is no need to reach a certain minimum dollar amount before collecting the cash. Using Hopster is one of the ways that I save money during fall (and throughout the year). Keep reading for more financially-smart ways to relish the season. We have a lot of trees on our property so fall means a TON of raking for us! It’s great exercise, so my husband & I often go out there and rake for an hour (or more)! Then when we’ve created nice piles, we invite the kids to come outside and jump in the piles. It’s amazing how much fun they can have from simply playing with leaves! 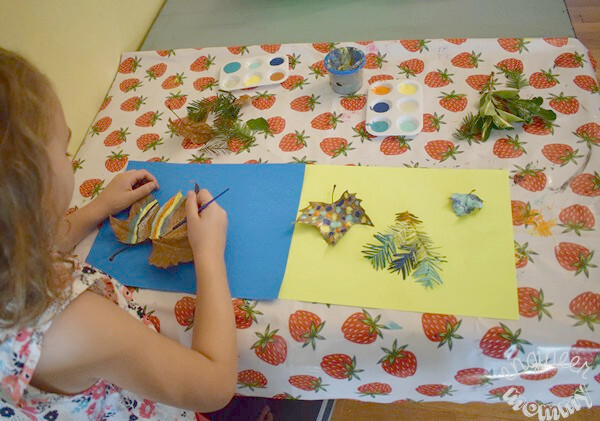 Another thing we like to do with the abundance of leaves is craft with them. Sophia & I brought a bunch inside the other day and painted them with acrylic colors. It was a super fun (and totally free) activity! We can discuss addition: 1 tsp of cinnamon plus 1 tsp of cinnamon equals 2 tsp of cinnamon. We can discuss fractions: 1/2 cup of flour added to 1/2 cup of flour results in 1 full cup of flour. We can discuss homogeneous mixtures vs heterogeneous mixtures, when it comes to combining the batter. 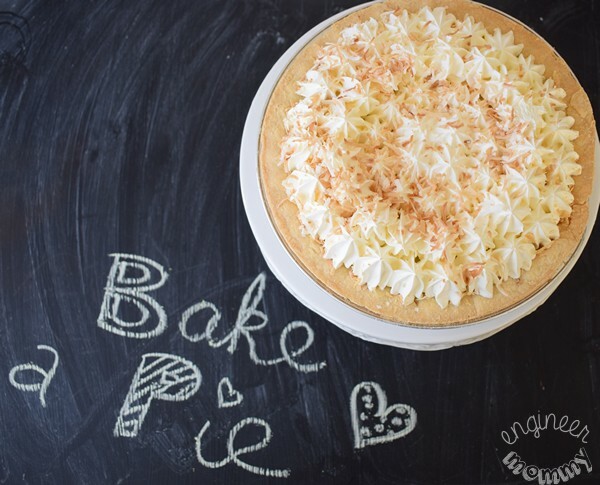 My girls and I recently made this coconut cream pie and it was so delicious! 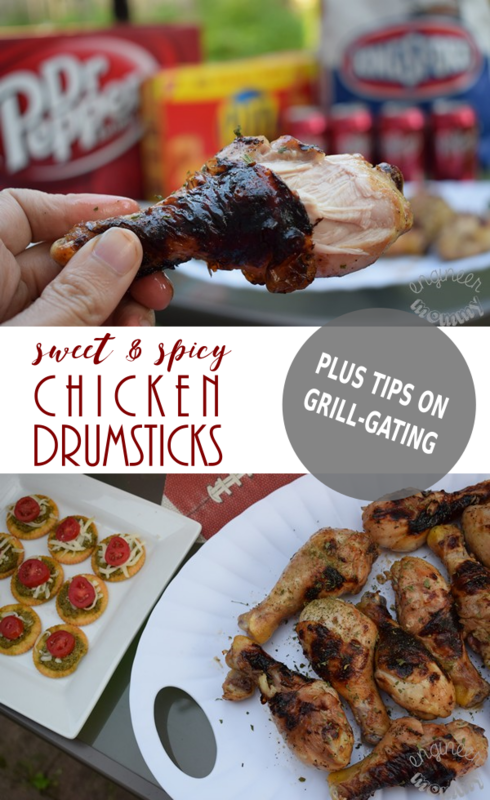 When it comes to celebrating fall on a budget, it’s all about the simple pleasures, such as whipping up a delicious treat in the kitchen. This is already a low-cost activity, and with Hopster, you can likely find rebates on some of the ingredients for your recipe! 3. 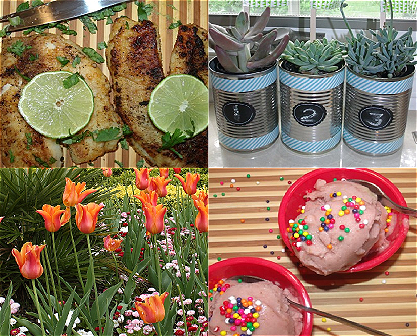 Save on essentials with Hopster! 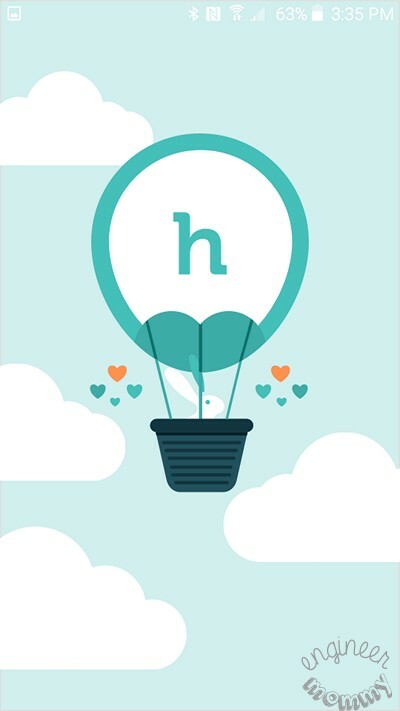 Use a money-saving app like Hopster to easily redeem rebates on purchases you make each month. It’s so easy to get started with this app. Start by downloading the app to your device via Google Play or the iTunes Apple Store. 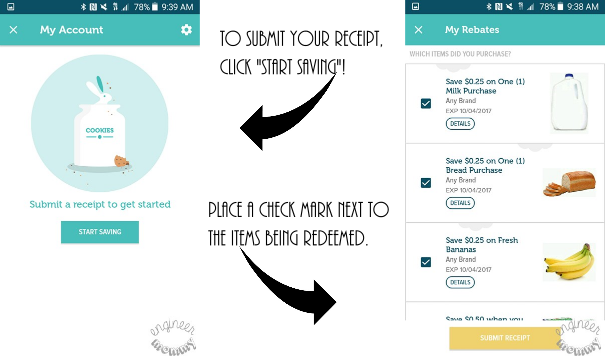 From the home page of the app, you can choose to browse rebates available at specific stores or rebates that are available everywhere. If you’re looking for rebates at a specific store, you’ll be happy to know there are many stores to choose from, such as Kmart, Kroger, Party City, Rite Aid, Walmart and more. It’s super simple to use Hopster. As you find products you plan on buying, click the little check-mark in the top right of the box. As you can see, I was planning on buying bananas, bread and milk. The app also lets you know the value of each rebate, so with this small shopping trip, I was able to earn $1.25 back. You’d be surprised by how quickly these amounts add up! When you’re ready to submit your receipt, simply click on “Start Saving” and you’ll be taken to a page that lists all the products you’ve selected recently. On that page, simply place a check mark next to the items that appear on your receipt and click “Submit Receipt” to take a picture of your receipt. 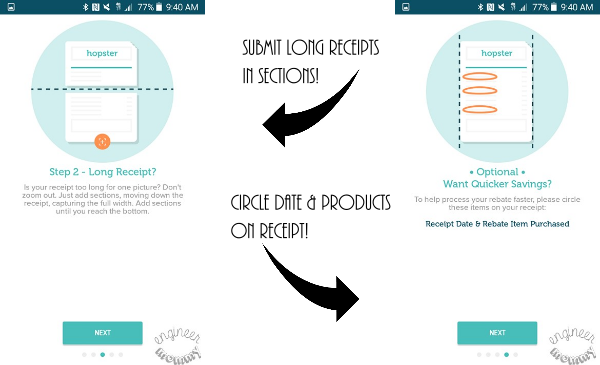 Hopster wants you to be successful so they provide multiple screens with useful tips to help you submit a receipt properly. For example, if your receipt is super long, simply submit it in sections. Also, to expedite your redemption, circle the date & items purchased directly on the receipt. 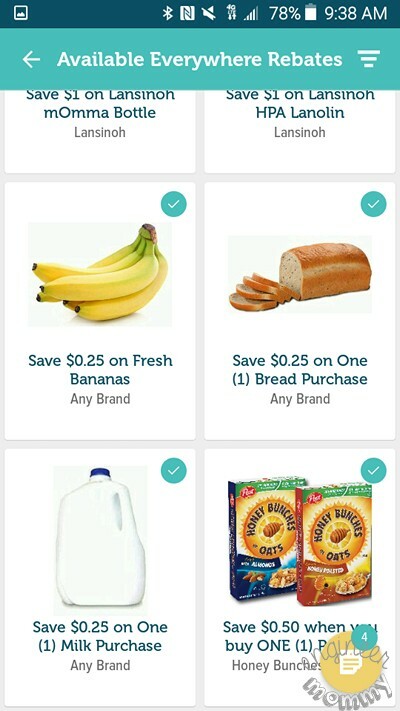 With Hopster, it’s so simple to save on purchases at any grocery, drug or mass merchandise store! 4. Re-purpose decor around the house! Store your decor in boxes from year to year. Don’t feel the need to purchase a lot each year. Purchase items during the post-holiday sales and store them for the next year. Find versatile pieces that can be easily stretched from season to season. 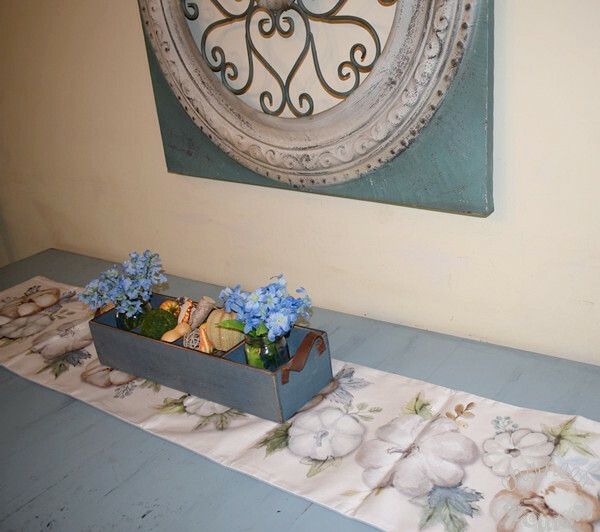 One example of a repurposed item that can work for multiple seasons is this four-compartment centerpiece on my dining table. I love that I can fill it with seasonal items to decorate for different times of the year. During summer, I fill the compartments with sand, blue candles & nautical decor. During Christmas, I fill the compartments with small ornaments and gold & silver candles. 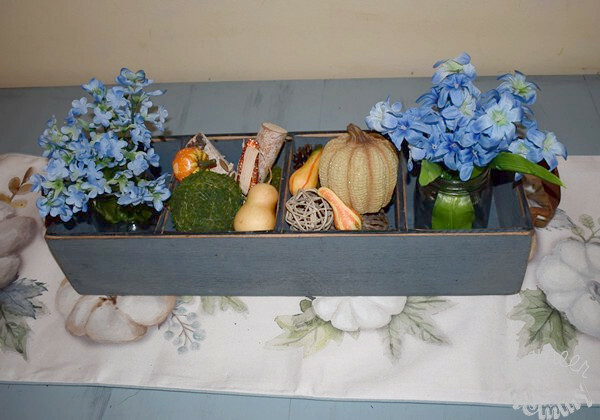 During fall, I fill the compartments with moss-covered balls, pumpkins and gourds. Easy peasy and beautifully versatile! I also like to place the centerpiece on a seasonal runner. I’m loving this neutral-toned one that features cream & sage pumpkins. 5. 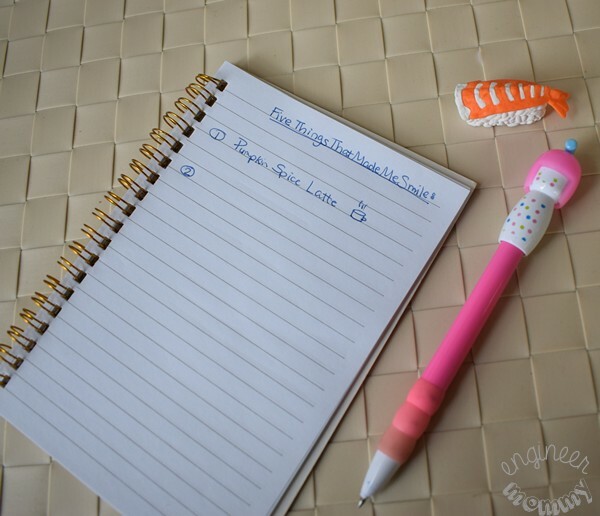 Write in a gratitude journal! One way to celebrate fall is to acknowledge everything you’re thankful for. With Thanksgiving just a few months away, it’s a great time to stop & remember those things – big and small – that make you happy on a daily basis. I love taking a few minutes at the end of the day to list out 5 Things That Made Me Smile Today. Sometimes I include finally finishing that DIY Home Remodeling project that I’ve been working on. Sometimes I include watching my kids’ delight as they play in the swimming pool. Sometimes I include that decadent coffee house drink that totally hit the spot on a cold morning. 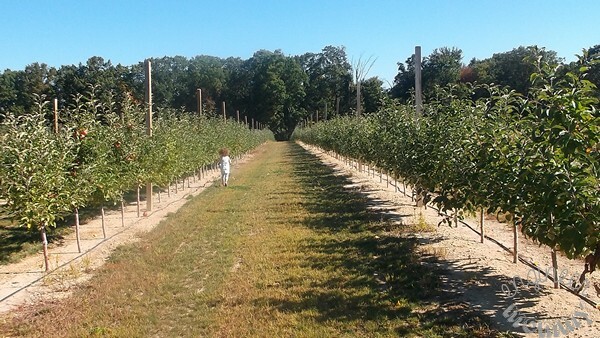 Every fall, we like to take the kids to the local apple orchards. We have a blast filling a bag with apples, enjoying some caramel apples and walking through the various rows of trees. We usually also take a hayride and explore the corn maze, too. It’s a low-cost fall activity that’s a lot of fun for the whole family. 7. 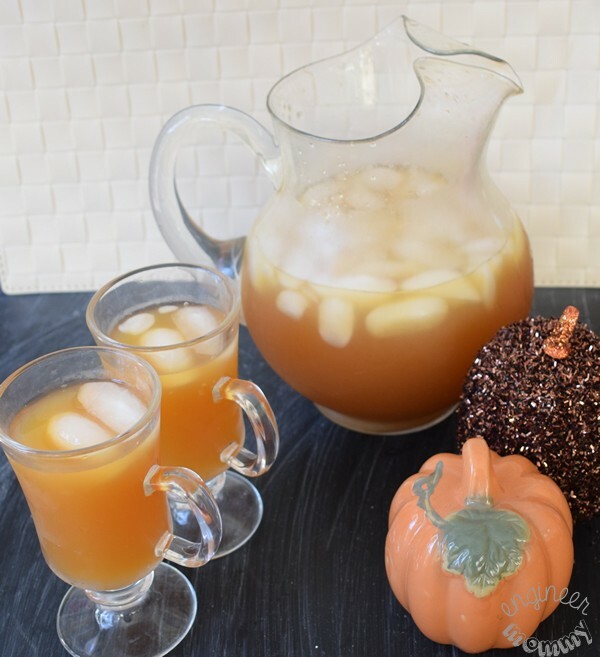 Make homemade apple cider! What do we do with all those apples? Make apple cider, of course! It’s such an easy recipe, too. Simply throw a bunch of apples in the slow cooker, along with cinnamon, sugar and allspice. After simmering for hours, strain the mixture through a fine sieve and serve warm. Don’t forget to check Hopster Mobile Rebates for potential savings on your recipe ingredients! 8. Add cozy elements to your home! It’s amazing what a difference a few cozy elements can add to the home. 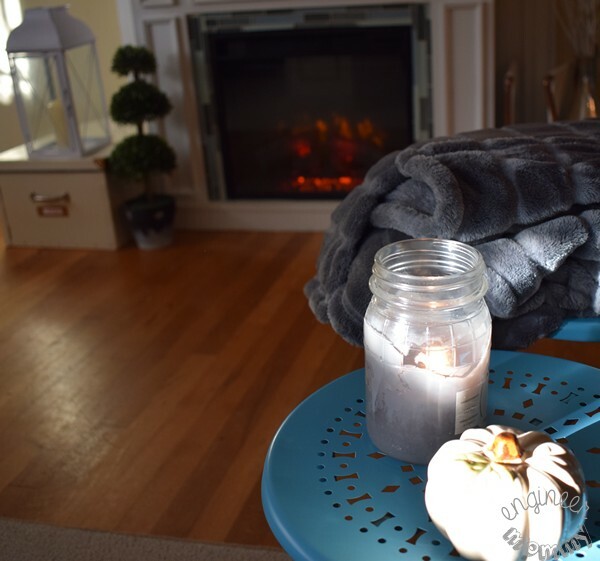 I love to add warm, decorative throws all over the house. Also, candles add a warm glow, a lovely scent & a flickering flame element to the home. While we’re talking about cozy elements, don’t forget the fuzzy slippers, hot chocolate and a warm robe! 9. 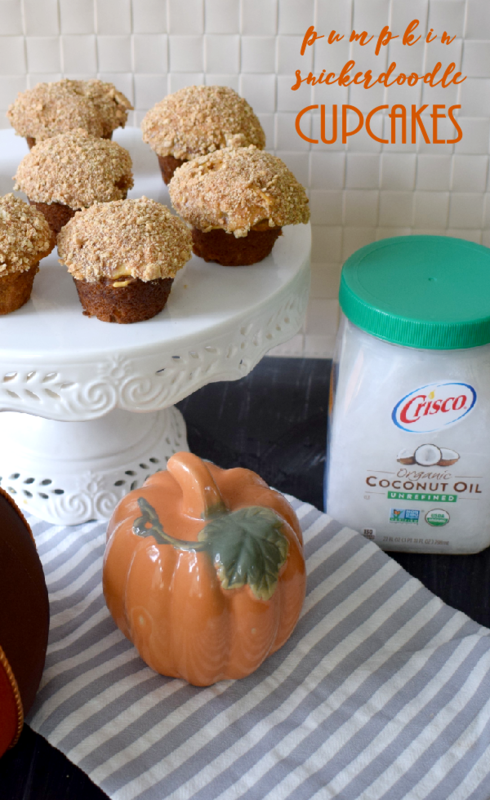 Incorporate pumpkin in your recipes! Add a spoonful of pumpkin puree to a cup of coffee, along with sugar, milk, and pumpkin spice powder. Blend together and enjoy a homemade pumpkin spice coffee! Add some pumpkin puree to your pancake batter. Serve the cooked pancakes with maple syrup & a dollop of freshly whipped cream for a tasty fall breakfast. 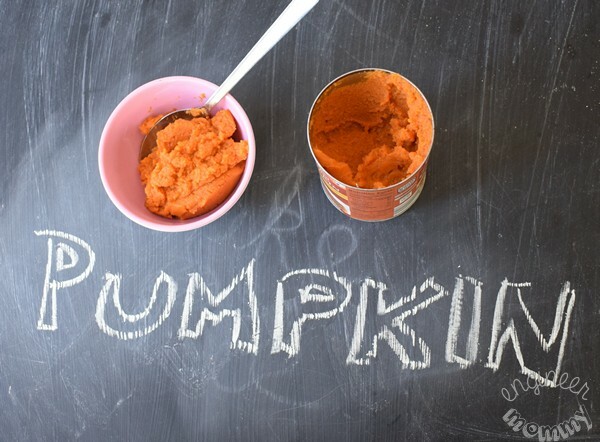 Create a pumpkin jam by combining pumpkin puree, corn starch and sugar over medium heat. Once thickened, spread on warm toast. Again, be sure to check Hopster for rebates on your recipe ingredients! Let Hopster be your smart shopping partner this year and collect rebates for groceries, beauty essentials, appliances and more! How do you save money during fall? What is your best financially-smart shopping tip? I need to check out Hopster! It sounds like an awesome way to save money, and I’m all about saving money, especially when it’s easy. These are all wonderful ideas. I am always looking for ways that I can save money and still have fun. We could have a lot of fun with all of this. I’ve not heard of Hopster before but it sounds really interesting and easy to use. When I get back in the States I’m going to give it a try. Between decor, seasonal treats and our annual visit to the pumpkin patch, fall tends to get expensive for our family. I look forward to downloading Hopster so it can help us save! We’ll definitely be doing some of these things. It will be nice to cut costs when we can by getting rebates. Fall is also my favorite season and it’s true it can be a costly one! I love all of your tips and suggestions! You also reminded me that my kids and I used to paint leaves!! Oh those were the days! Miss doing things like this. I will see if I can get them to sit down with me and do that again for nostalgia’s sake! These are truly awesome and doable tips! I love that they get the family involved. I especially enjoyed the Gratitude Journal, Homemade Apple Cider, Painting Leaves and Making Pies! 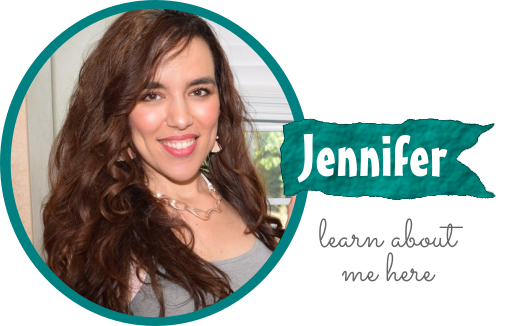 These are all things I can do with my family without the hassle of them not wanting to participate! 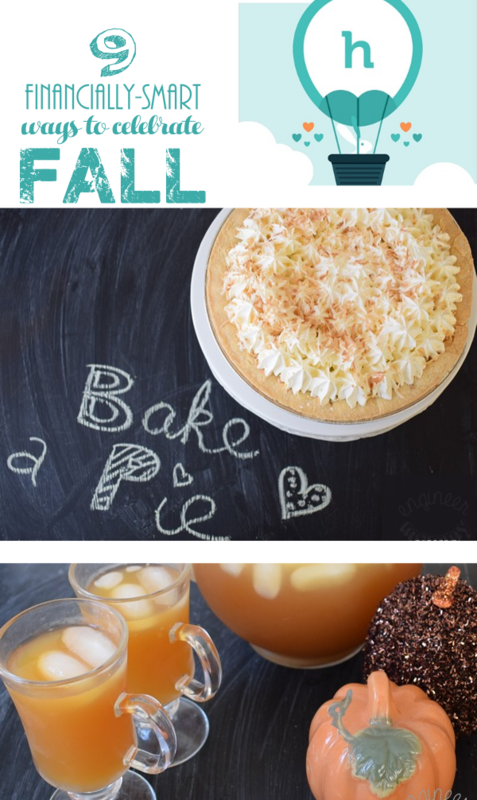 These all sound like wonderful things to do for fall when trying not to spend too much moolah!! I am definitely on a pie kick and can’t wait to try a new recipe I found! So many ways to celebrate the season without overspending! I think these are very awesome suggestions. I do love getting apps that will help me avail coupons, discounts, and earn rebates! Who doesn’t love saving money? We love apps like this, it is so easy to use. Rebates are so much easier to get nowadays versus when I was much younger! I have been hearing a lot about Hopster recently. I love to save lonely so I will definitely be checking it out.